Happily married to my last and forever man. 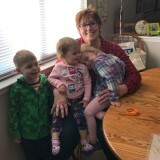 4 beautiful kids between us, 4 amazing grandkids. Been rocked to my knees but I'm still able to stand and survive all life has thrown at me.